Rated 5 stars by Bay Area Climbers! 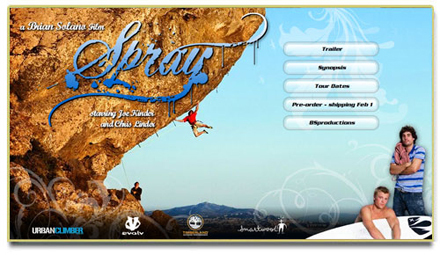 SPRAY, the fourth feature film from BS Productions, captures the true spirit of climbing. Filmmaker Brian Solano followed Joe Kinder and Chris Lindner on their most recent journey documenting every moment in crystal clear High Definition video. The team set out to explore the treasures of California's northern coastline. They ventured through the delicate beaches of Arcata, the stunning limestone of the Trinity Aretes, the historical shores of Mickey's Beach, and the alpine stone of Donner Summit. The film features numerous first ascents, including Chris Lindner's oceanside route Window of Opportunity. We will be adding a Movie review next month on our website. This CD has been given a 5 star rating! SPRAY showcases some really cool climbs in NorCal!